By now, your WordPress blog or website should be GDPR compliant (the law came into affect today). Two of the GDPR obligations you need to fulfil are Subject Access Requests (SAR) and allowing your users or visitors to erase their data. Luckily, WordPress 4.9.6 provides two new tools to allow you to achieve just that. 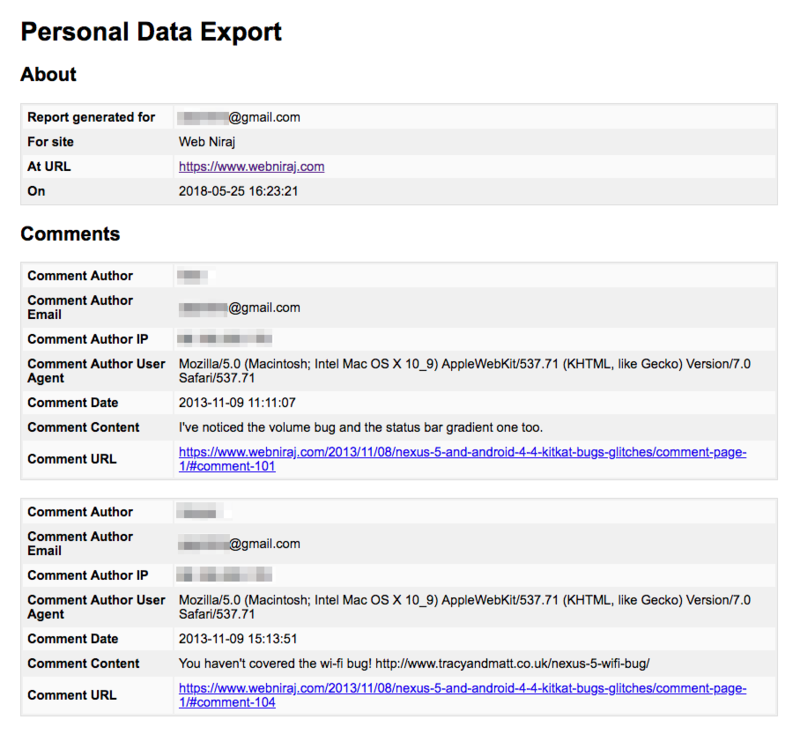 Export Personal Data – helping you deal with SARs, where the user requests what data you hold about them. Erase Personal Data – allowing you to delete a user’s personal details easily (if they are tired to an email address). The [Export Personal Data] option lets you enter a user’s email address, which then needs to verified by the owner of that email. Once the email has been verified, you (as the website owner) can generate a zip file of the user’s data, which is automatically emailed to the user. As you can see, the report contains the comments this user has made on the site, along with some PII information (i.e. the email address, name and IP address). The report could also contain images uploaded by the user, in which case, a URL to the uploaded file is included in the report. If the user’s email address isn’t used, a report will still be generated and sent, but it would only contain the email address the report was generated for, and date / time of the report. The report is automatically emailed to the user in a Zip file, which contains a HTML report. Exports are cached on the server for 3 days and then deleted. The [Erase Personal Data] option allows you to meet your erasure obligations by allowing you to easily delete any user data on your site. Like the above Export tool, it allows you to enter a user’s email address to verify their request. Once the request has been verified, you can action the deletion of their personal data from your site. The two above tools may not work with any plugins you use that collect personal data, unless they have been specifically updated to work with the tools. WordPress provides hooks developers can use to make their plugins compatible with the exporter tools, but it’s up to the developers to implement the functionality. Until such time as your favourite plugin has been updated, you may still need to export or erase some personal data manually.